Clone2Go Video to Nokia Converter - Convert any videos to Nokia video. Clone2go Video to Nokia Converter is powerful software that makes it easy for you to convert video files to Nokia supportable formats. With Clone2go Video to Nokia Ripper, you can convert video files between all popular video formats such as WMV, FLV, MPEG-4, MPG, AVI and 3GP. You may choose the output formats such as MP4 which are supportable for Nokia N-series; you can convert videos at high speed with perfect output quality; extract audio in MP3 format from video clips and enjoy a user-friendly interface and an easy-to-use style. Clone2go Video to Nokia Converter brings convenience in batch file conversion which just needs simple steps. You can download FLV videos from YouTube.com or Google Video and convert FLV to other formats through this software. The interface of the converter is simple but fashionable. Based on the easy-to-use style, it brings convenience to users. No matter whether you are a skillful pc operator or the beginner, you may find it easy to convert the video files for your media players. What you need is only a few clicks. The Converter has the user-friendly interface, easy-to-use style, perfect output quality, high conversion speed as well as various input and output formats. 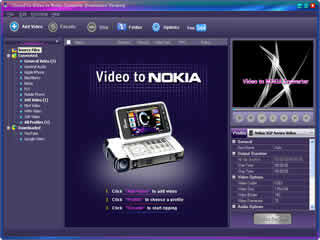 It will be your good helper in video to Nokia conversion.